You may be so enamored with the house that you fail to observe what’s going on in the surrounding area. It’s important that you take notice of the neighborhood you’re considering and determine if it’s the right fit for you and your family. Purchasing a home is an investment – usually for the long term, so take time to notice the pulse of the community. 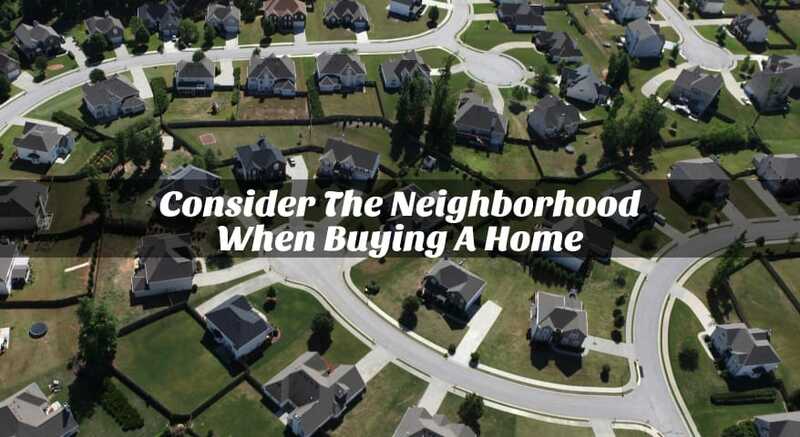 Talk to neighbors if possible and note if the area is perhaps in transition from being a bad neighborhood to an up-and-coming one – or has it already made the transition. One way to determine if the price of the home you’re considering is fair for the neighborhood is to research home values and foreclosures in the locality. Homes in transitional neighborhoods may be a good investment, but it could take time for that to happen. Considering the school system in the area is a major decision factor if you have children. You can get grades and ranks of schools in the area at some online sites such as GreatSchools.org. Your home will maintain or increase its value if it’s in the area of high-ranking schools. Buying a home in the thick of restaurants, stores and “action” may seem exciting, but are you sure you’re ready to put up with the noise and traffic associated with it? Even neighborhoods that aren’t in downtown may be noisy, so it’s a good idea to visit the area at various times of the day. Pay attention to traffic patterns at rush hour, weekends, the buzz of planes from an airport, a church that takes all the parking spaces on Sunday morning and does the neighborhood appear more dangerous at night? Notice the condition of the roads around the neighborhood. Are they clean and smooth or are there potholes and trash on the curbs. Also note if there are sidewalks, public transportation and nearby fire and police stations. If you’re not comfortable with the appearance of the neighborhood, the future value and appreciation of your home may be affected and the enjoyment of your time there may be compromised. Finally, consider the proximity of a new home to work and the things you love. Stores and schools ae also important in the scheme of things and your commute may be longer than you want it to be. Proximity to work can become critical when you have to spend an hour or more in the car, morning and evening, and don’t get to enjoy the house as much as you could if you lived closer. Mass transportation might be the answer and can also have a good effect on your home’s value. A neighborhood with walkways, neighborhood watch and no vandalism indicates you’ve chosen a safe neighborhood. Your realtor can help you in this quest and you can also search crimes in this neighborhood on the local website for the police or FBI.gov.